Even while working on the first Space Escape I spent a good amount of time just looking for a way to make a Milk Way skybox, featuring, you know, stars. I did get an ok skybox with some rather ordinary looking stars. I was able to find some fairly high res images of the Earth's night sky as a panorama. How to make a skybox out of that? The stuff I found mostly involved tossing the panorama on some sort of sphere or dome and then rendering that six times (one for each side of the skybox) to an image. This seems pretty hacky to me. Perhaps I just don't know how to wield Blender enough. I don't have Maya/Max, or a full version of Photoshop, so my options are pretty limited. Instead of doing a skybox, I instead made a sphere with its material set to Particles/Alpha Blended. The sphere is set at 0, 0, 0 under the main camera, so it follows your view around everywhere. 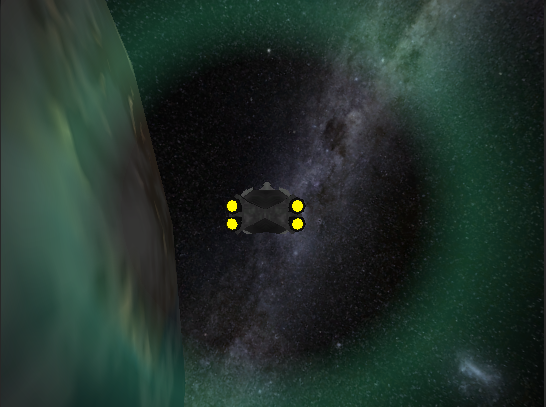 I had to turn off the collider so I wouldn't get problems with flares (which come fromt he sun). Everything in the game has a large or far scale, so I made the sphere very large. Unfortunately I can make it really large in the game world (where I can adjust the far clip plane of the camera), but it can make navigating in the editor a little clunky. If an artist helped me out I'd certainly welcome it, but at the moment I can move forward, and that's what counts. Having the Milky Way streaking across the view really adds to the look of the game.